Marbles is simple enough to dive straight into but has plenty of depth to keep you experimenting and your patches evolving. Cleverly designed and very powerful, Marbles provides a huge range of random CV and gate options. Orange and Red LEDs are hard to distinguish from each other. The new Mutable Instruments module Marbles combines the rhythm generation and probability of MI modules Grids and Branches and the lockable random pitches of Music Things Turing Machine to create a generative musical powerhouse. The left-hand side focuses on rhythm, generating three clock outputs at a tempo set by the Rate knob and a multiply/divide switch (or from an external clock). X2 is always a copy of the master clock but there are three different modes for the gate generation of X1 and X3. The green mode operates like MI’s Branches module; a virtual coin toss is made on each pulse to decide whether X1 or X3 emits a pulse. The Orange mode offers differing multiplication and division ratios on X1 and X3, while the Red mode works similarly to the Grids module with Kick and Snare patterns on X1 and X3 (X2 can be used for Hats). The Bias knob affects the probability weighting of a gate appearing on T1 to the left or T3 to the right; meanwhile the Jitter control introduces some humanness to the clock, with beats playing slightly ahead or behind. Modest amounts of Jitter give you J Dilla-style beats but with Jitter fully clockwise we got really interesting swung rhythms with the melody which sounded great on a 4x4 kick. Pulse width of the gates can also be adjusted overall but as a standard there is some variety in the gate length which is great for any envelope with a sustain stage. The lack of a reset input is unusual; the ability to reset the pattern would give you greater freedom to experiment with tempo and pattern length and trigger Bias while remaining within a standard song framework. The right-hand side is where the voltages are produced; the T1,T2,T3 outputs are clocked by the X1,X2,X3 triggers unless a separate clock is patched to the right clock input. The Steps, Spread and Bias controls then offer you various ways of controlling the musical notes that are output from the random pattern. Steps alters the output through varying degrees of quantisation to a completely smooth random signal. Spread controls the probability distribution of voltages and Bias affects whether those voltages are weighted to the low or high ends of the scale. In nature it is unusual for a sound to repeat exactly and the human ear is quickly bored by perfect repetitions. Analogue synths sound great with their inconsistencies. In a modern modular system, the electronics are a lot more stable but mixers, attenuators and attenuverters can play an essential role in limiting and directing a random signal to the same ends. By mixing small amounts of a random signal into filter cutoff, FM, gate length, ADSR, wave shape, etc, subtle changes can occur that bring a naturalness to the synthesised sound. Together these offer a wealth of control over your pattern. At the top of the module the lock buttons for X and T enable either the rhythm or the pitch or both to be locked into a repeating pattern defined by the Length knob. When you want a bit of variety you can turn the Deja Vu knob to the left to let in a bit of new random information or to the right to get a random change within the currently locked values. This ability to lock a pattern is what takes Marbles out of experimental noodling territory and into the musical realm. Even with both X and T locked there is still plenty of scope for variation using the Steps, Spread and Bias controls. These are great for hands-on play but even better is to use a separate step sequencer (or three) clocked at a slower rate to modulate these parameters. In the centre of the module the Y output is a constantly changing random voltage; it’s not affected by the Deja Vu control but its speed is related to the Rate parameters. By holding down a button, four of the main knobs change function and can be used to control its speed, amplitude, offset and quantisation, giving you greater control. This is particularly useful for self patching, something that Marbles really lends itself to. Attenuation is important to get the best out of Marbles’ control voltages. Usefully, the modulation output range can be switched between 2v/5v/+-5v. The 2v output gives you both the most usable musical range (2 octaves) and an already attenuated control voltage. If using the orange mode for X, you can use two outputs for quantised melody and gain an extra smooth random output for self-patching. The built-in quantiser provides six different scales, but these can be overwritten by playing in a sequence from a keyboard in your chosen scale. The notes played most frequently will be the notes that remain when you move through the scale with the Steps knob. This is an ingenious and very musical method of working within a scale. The drum generation mode was not very inspiring and we found ourselves using both sides of Marbles together to generate rhythmic musical sequences and evolving generative patches. We’ve always been a fan of the Turing Machine but Marbles builds on it with much more control and it’s very quick to come up with something interesting and start building a track. If you’re looking for more control over the pattern, an external sequencer can be connected through the Spread input, allowing you to program a sequence directly but then use Marbles’ controls to redefine it - a great option, giving a new lease of life to an old sequencer. For use as a standard random source the X section has its own clock input so it can be used independently. The module can then be patched to output a variety of random triggers and a range of quantised and un-quantised random voltages simultaneously. 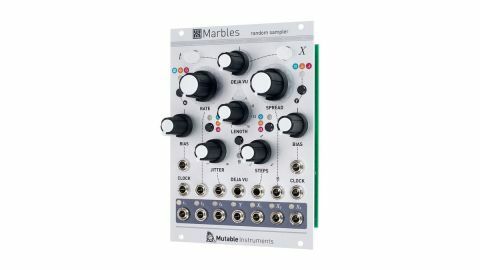 Marbles really covers a lot of different ground; it’s a versatile random source, an inspiring rhythm and musical idea generator, an expander for your old sequencer, an oscillator or a bitcrusher. Great value and great fun.